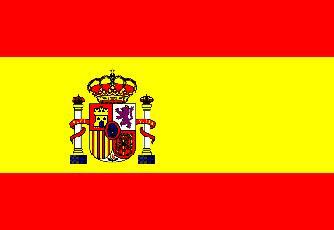 This is the web's biggest English language guide featuring the region of Galicia in green Spain. It offers tourist, holiday and general interest information about Galicia's provinces, cities, towns, history, monuments, culture, festivals, beaches, heritage and hotels. In short it should provide you with all the information required to plan and arrange a Galician vacation or, alternatively, simply to explore Galicia on-line. 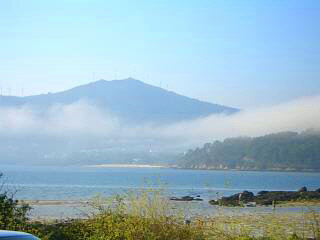 There is also a property in Galicia section if you are considering buying a casa (house) or villa there. New and updated information is added on a continual basis, so please call back and see us again. GaliciaGuide.com contains over 580 pages and more than 3000 photographs describing and depicting Galicia Spain, and offering our views and opinions on the places and attractions that it has to offer. 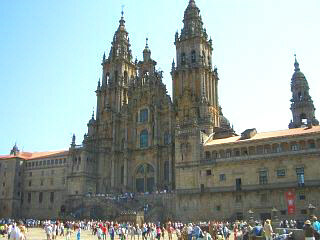 Right, Santiago de Compostela cathedral, the region's most famous example of architectural heritage. Galicia Guide has detailed sections covering the provinces and cities of Santiago de Compostela, Lugo, la Coruna, Pontevedra and Ourense, plus further pages about the cities of Vigo, Tui, Ferrol and neighbouring region Asturias. We also have a large section covering the Way of Saint James or Camino de Santiago which includes a full stage by stage guide to the French Way. Click on the Galician Towns button in the main left menu to read guides about over 60 different towns, village and places to visit in this beautiful part of green Spain. Quick Links - See how affordable property can be in Galicia. 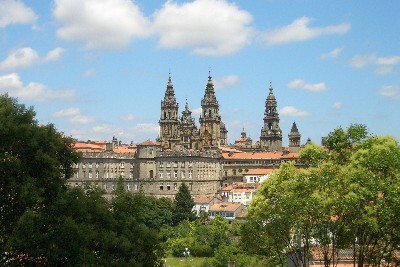 Ever though about taking a holiday in Galicia! see this holiday summary page to find out more. 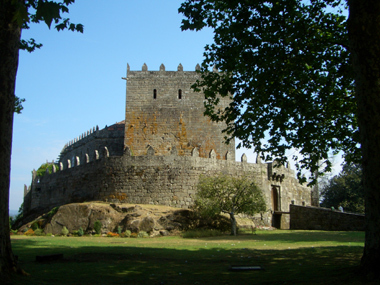 Part of Galicia's tourist appeal is of course its many historic towns and villages and we offer comprehensive descriptions of many of these localities including Noia, Muros, Ribeira, Rianxo, Tui, Padron, A Pobra do Caraminal, Porto do Son and many more. All these towns can be accessed from the Galician Towns button. You will also find information about Galicia's architecture, cuisine, culture and beaches, plus holiday planning resources that will enable you to organise and book everything from your hotels, villas and flights through to your car rental. There are also pages offering details of tour companies and property purchase contacts. The main body of the guide is however dedicated to sightseeing attractions and as you will see Galicia has a lot to offer. Galicia is situated on the North West coast of Green Spain, just above Portugal, making it a geographically, scenically and culturally different to many of Spain's better known southern provinces. It has a warm but temperate climate and a lush landscape with mountain ranges, rivers and a non stop supply of stunning and often near deserted beaches. Galicia's two international airports are located in la Coruna and Santiago de Compostela and getting to the region has never been easier, at least from the UK. If you want to discover more, then explore this site using the navigation menus to select the places and topics that interest you. Remember, there are almost 400 pages describing Galicia on this site, so you should find what you are looking for. There are two constant navigation indexes, one that appears in the menu bar running down the left hand side of all pages and the other at the top of each page. A sub index, listing items in the section you select from this main menu, will then appear in the right hand menu bar. E.g. if you select "Lugo", you will see a series of buttons appear in the right menu within this section. To return to this home page at anytime, click on the "home" link which appears at the top left of all pages. If you want to find out about a particular town’s fiestas (festivals), beaches, museums, landmarks, civic or religious buildings, you need to go to the town or city guide in question. From there you will be able to access timetables, locations and descriptions for that specific locality. Some of these towns have their own separate multi page guide. Above/right, a medieval castle perched on a hill top. GaliciaGuide.com is now the most complete English language resource on the internet for everything from destination information and holiday advice, to hotel, flight and car rental booking in Galicia. We add new content every week with the intention of giving you the best idea possible of what you can expect to find and do if you are considering visiting this part of green Spain. You will also find the guide useful if you are thinking about buying a holiday home in Galicia, or moving to the area permanently. We also ensure that we keep our commercial content easily accessible, but separate from the actual guides and information pages. You will not see any banners or annoying ads whilst you are reading about the places you may be planning to visit, however all the services you require to arrange your Galicia holiday will never be more than one click away. This site is not commercially funded or influenced by advertisers or sponsors. All views, opinions and reviews are solely those of "Galicia Guide" and express our "take" on a town, monument, regional dish or beach. If you disagree with anything we say, let us know. We hope that you enjoy our destination guide and that it will inspire you to visit the "greener" part of the Iberian Peninsula. 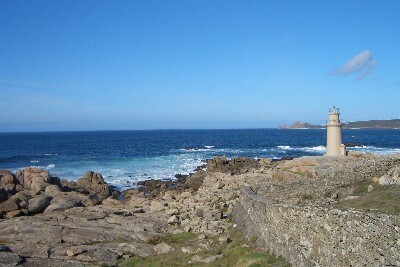 Above, one of the bays or "rias" in A Coruna province. If you would like to contact us with feedback, to suggest additional content, to exchange links or because you are having problems viewing this site on your browser, click on the Contact us link in the yellow header bar. We hope that you enjoy GaliciaGuide.com and become one of our regular visitors. Please be aware that in 2007 we successfully took out an action against another website that copied some of our content. We will have no hesitation in pursing a similar action against any other publication (on-line or in hard copy) who choose to plagiarize our written content, or steal our photos. If you would like publishable information about Galicia, you can copy any of the articles found from the link “Add one of our articles to your site” (in the right hand column of this page). If you want photos, then contact us directly.